Late at night and unannounced, we were afforded a great amount of courtesy and respect by being invited into Minneapolis Mayor Betsy Hodges' home by her husband Gary Cunningham to engage in a dialogue regarding the murder of Jamar Clark at the hands of the Minneapolis Police Department. "Whether you live on the north or the south side of Minneapolis, or anywhere in the metro area, all Minneapolis neighbors deserve the same level of respect that we received tonight," stated Sam Gould, a Minneapolis artist and longtime activist. 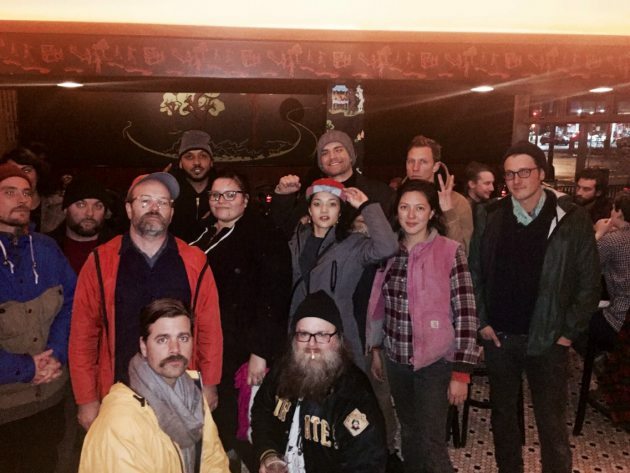 Sam, along with Ashley Fairbanks, led myself and a motley crew of 13 Minneapolis residents and artists that decided to leave the 4th Precinct on the North side to ask the mayor to have the MPD stand down, after witnessing repeated accounts of abuse on Minneapolis citizens and peaceful protestors tonight. Those accounts of abuse performed by the MPD present including but not limited to: physical intimidation, rubber bullets, tear gas, and mace. Not only this, we witnessed MPD officers point a loaded weapon at Minneapolis Council Member Cam Gordon, followed by the brave actions of Minneapolis Council Member Lisa Bender stepping in front of the officer, telling him to stand down. If Council Members are asking the Minneapolis Police to stand down at gun point, Mayor Hodges should do the same from the safety of City Hall. Further delay from Mayor Hodges only exacerbates what is already a tenuous situation. We call on Mayor Hodges to stand with Minneapolis residents and meet the demands of protestors, to represent those that elected her to be our mayor, and to get out in front of this tragic situation. Another account this evening was when MPD pulled up with military gear and non-lethal rubber bullets which struck a 14 year-old in the chest who was peacefully protesting. In fact, the young man who we are refraining to state his name due to him being a minor, was conducting a dance routine to prevent young protesters from getting restless. Jeremiah Bey an community organizer, artist and native of the Northside was confronted by the MPD with non-lethal weapons in an attempt to bait protesters into a violent outburst. "We were standing around and things were actually calming down, when all of a sudden a white van pulled into the crowd with cops pushing out and shoving people while aiming their weapons at close range." shared Bey. 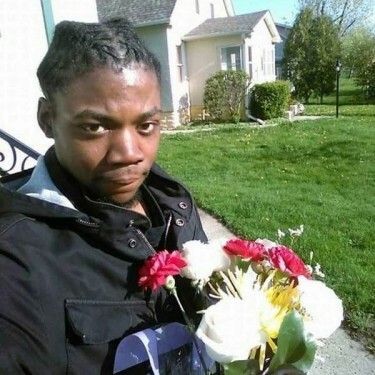 Jamar Clark died earlier this week due to a gunshot wound to the head on the North side of Minneapolis allegedly while handcuffed by the MPD. Last month I stopped by Nico's Tacos and Tequila Bar located on 2516 Hennepin Ave South in the corazon of Uptown Minneapolis and was captivated by the contemporary Mexican art on the walls, the sounds of Colombian band Bomba Estereo's hit Fuego, and an amazing list selection of Tequila that doesn't have room or your typical Patron or Cuervo placement. As I got ready to order a margarita special and start my date with agave, I didn't hesitate to place my order for the barbacoa and shrimp tacos. "Oh those are so good," shouted out a woman upstairs on the 2nd floor bar which serves as a simple taqueria/bar inside of an old house. That lady wasn't at all off with her statement. The tacos were filled with stewed barbacoa and fresh shrimp along with the simplicity of onions, cilantro, radish and limon that had enough sabor to get my attention for 2 more. Right away I asked my server to send Latino love to the kitchen and thank the person who satisfied my appetite before I could even add any hot salsa to my meal. I was informed that the woman who prepared my tacos is Blanca Judith Laguna of Nogales, Mexico who arrived to cook in Minneapolis in 2007 working at Amore Victoria. 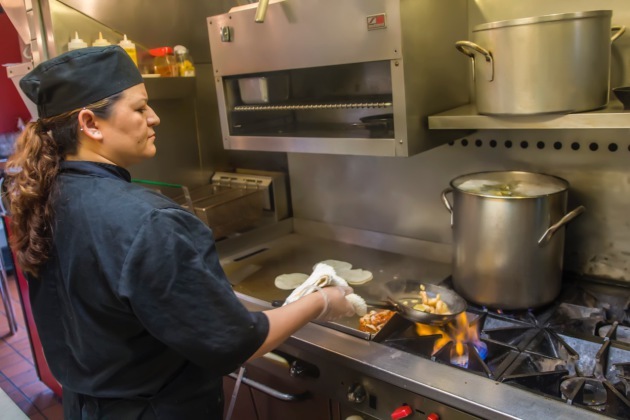 As soon as owner Alejandro Victoria and his wife Jenna opened Nico's Taco and Tequila Bar (named after one of their sons), Blanca worked her way up to becoming head chef providing her expertise of small tacos with tons of flavor influenced by her native of northern Mexican cuisine and the bordertowns of Arizona, New Mexico and Texas. I returned to Nico's the following week to spend some time around the uptown area and focusing on learning about Latinos in the community who provide a strong influence being proud of their migration while dedicated towards making Minnesota a comfortable state for all who work and call it home. 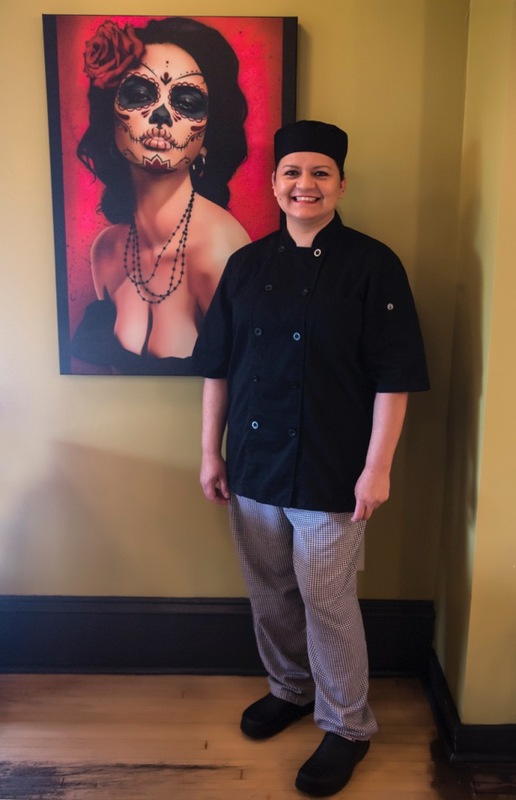 Blanca is one of those women who is passionate about her job, and excited to prepare a fresh dish whether small or big to present her skills in the culinary arts. She shares that same glow and teamwork alongside her colleague and Nico's drink specialist Johnny Holder. Holder is one of the best bartenders in the city who offers a chain of tequila infused cocktails (all prepared by himself) and makes the house/restaurant in uptown one of my favorite chill spots after a long day recording at a near-by studio. Specialty: Mexican food from the Northern region to Tex-Mex cuisine. Favorite Music/Artist to inspire her cooking lately: Lourde " I love Lourde. Most of the other staff and cooks will prepare their day listening to banda,musica del norte... which I to enjoy, but I prefer to sing Lourde and listen to a variety of different musical genres. From pop, to salsa, to ballads and alternative. As of lately..you can catch me singing Lourde. It gives me a boost when I begin to prepare food and season food like carnitas, which can be 4 hours before hand and when I cook, Lourde's music allows me to get excited and to bring my flavor to the plato (dish). Favorite dishes to prepare at Nico's: A lot of people enjoy the way I prepare the barbacoa, however I do enjoy making shrimp and chicken dishes here at Nico's. It's all about the flavoring and the heat on that grill. I love it! Just something that I feel confident in preparing and love to make the customers here at Nico's feel good off food that represents my motherland. 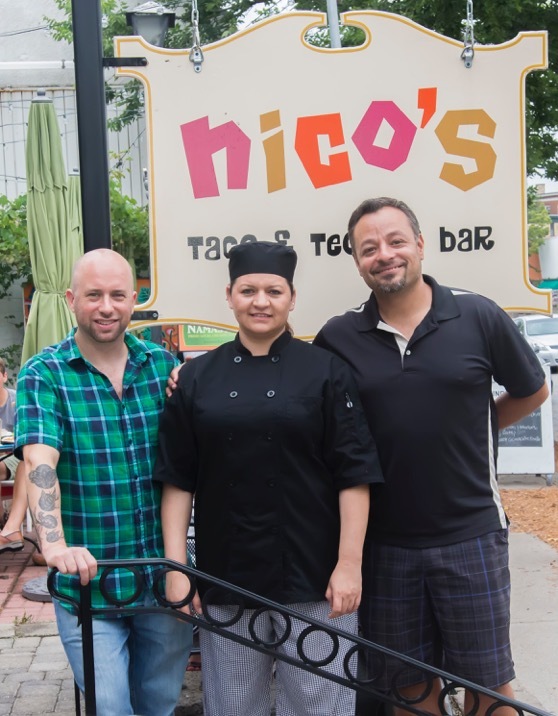 What inspires your preperation and desire to bring more flavor and recipes to Nico's? The people who compliment my dishes. Especially people who know my style of Mexican cooking. Whenever a Mexican who's familiar with my style of cooking comes up to me and says, "Now that's good Tex-Mex, or comida Nortena." What advice do you share to youth in the Latino community who want to be in the position that you are in? My main advice is what I share with the Latino youth in the community, specifically my son who's in high school that you have to set up a goal and be passionate about it. My son, he see's that I work hard and he's already dedicated towards following my footsteps. He notices that me and my staff are the heart of this restaurant and he is inspired by us to study to be a chef. I believe that our orgullo/pride as Mexicans or Latinos who traveled from a far to be where we are and continue to survive the struggles overcome each day can help our youth take advantage of every opportunity given to them so that they can excel in what ever they want to accomplish. I am an example of that. I worry for those who get lost on a different path due to the barrier that are placed in our ways a lot, but even if your lost you can find a road to take you to where you want to do well in and share with your families. That is the orgullo, the pride I hold on to and glad that my youngest son is passionate and hard working. 1 year. 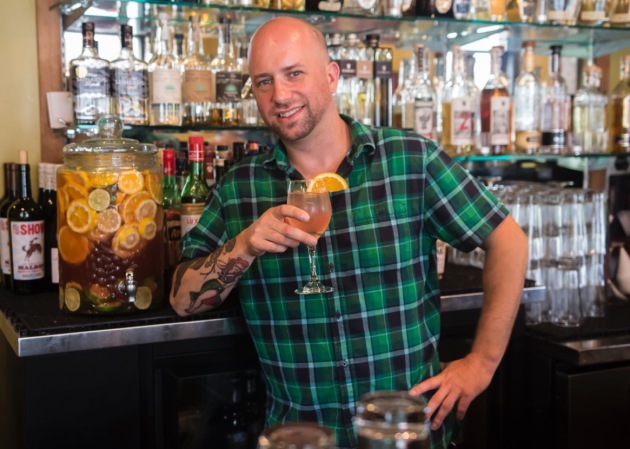 I previous was a bartender at the Icehouse in Minneapolis, where there's 100 different Bourbons, used to infuse vodka at a few different bars starting 15 years ago. Never really worked with Tequila until a year ago when I started at Nico's and now I'm like a Tequila King. I've infused and can't stop making drink specialties every week. Which was your first Tequila special? How'd the magic happen? I was right here in the cocktail lounge and I created El Nino and it's Tequila and Malbec, simple serve lime juice with orange liquor and bitters, shaken in a margarita glass. It was like a Sangria, kind of but with Tequila and I made it into a cocktail version instead of an infusion. Then I made another called Con Permiso in the winter giving me more time to spend with the drink. It's tequila with pear liquor, lemon juice and a few different bitters. Well one of my favorites is The Pucker Up tequila infused with grapefruit. Whats your favorite tequila to work with? I love working with the Anejos in cocktails, its so much more classic than the blanco tequila and has an aged different flavor and serves a unique way to turn tequilas into a cocktail. I love one called The Medicine Man which is a margarita with smoked sage and reposed tequila, that's one of our best sellers here. Celebrate Dia de los Muertos at Nico's this weekend!! Food and Drink specials including authentic Mexican classics and sensational specialty margaritas and tequila flights compliments of Johnny Holder. Complimentary Hot Cocoa for the kids.